When reading, only around 20% of your time is spent processing content. The remaining 80% is spent physically moving your eyes from word to word and scanning for the next [Optimal Recognition Point]...Spritzing presents reading content with the ORP located at the specific place where you’re already looking, allowing you to read without having to move your eyes. With this approach, reading becomes more efficient because Spritzing increases the time your brain spends processing content without having to waste time searching for the next word’s ORP. Spritzing also enhances reading on small screens. Because the human eye can focus on about 13 characters at a time, Spritzing requires only 13 characters’ worth of space inside our redicle. They market it as a means by which to consume content more quickly and I can definitely see the value (say, for getting through boring work-related documents). Apparently retention is quite good using the app and you can actually consume far more content because you (again, apparently) get less tired viewing the content in this way. But instead of speed-reading, I see the value of Spritz being the ability to separate the content from the interface. The web is noisy. Apps are noisy. Companies build sites and apps with the intention of getting us to do something (for the most part). And when what we want to do is just consume content, it can be very very difficult to accomplish that task. in fact, it almost feels like that's the one task companies don't actually take into consideration when they design interactions or interfaces. For example: ads that take over the screen after you've already started reading or animations/videos that auto-run in the headers or side margins of the screen. They make task completion even slower. Especially when that task is consuming content. Now, I love apps and plug-ins like Clearly from Evernote which magically makes all the visual noise disappear from web pages so I can read on-screen without distraction. But Clearly is a desktop Chrome plug-in which means I can't use it on my phone or at work. And I have yet to see many other options to divorce content from its container in order to allow better focus. If user-centered design was truly user-centered, there would be a way (other than "print view") to turn off (or at least mute!) the noise, and focus on the content. Spritz is a great first step but I would love to see more. In fact, Spritz sits on top of the interface you are viewing, almost like a pop-up window. I would prefer if it took up the entire screen and had a blank background, to place focus entirely on the content: the words flashing on the screen. Right now, with the current integration into the screen it allows for too much peripheral noise; but small design tweaks could enable it to become the sole focus on the screen and provide users with a nice, quiet alternative to consume text. Doesn't that sound lovely? What can we do, as designers and developers? If we continue to complicate our interfaces or add distractions then we continue to frustrate our users. And they will turn to apps like Spritz to clean our interfaces so that they can get what they need. Instead, we should be learning from these types of apps in order to improve our interfaces and prevent distraction (yes, even when our financial models are based on ad revenue and sales). If content is key, then why do we sabotage ourselves by designing our sites and apps to actually dissuade users from consuming that content? Consider your own website or app: Is consumption one of your primary user tasks? Are you enabling or hindering that task in particular? When we design app flows, it's customary to remove distractions to enable the user to complete the funnel. What if we look at content consumption the same way: what would it take for us to add the ability to isolate the content for reading on-screen? If the user has the ability to make it through the content without distraction, isn't there a better chance that they will be able to appreciate it, act on the call to action and/or possibly come back? Mobile design seems to be better at minimizing noise than design for other platforms (in particular, desktop). But regardless of platform, if we're too noisy, the consumer will find a way around the noise (or avoid it altogether) with apps like Spritz. If we recognize consumption as a task in itself, we can build in mechanisms to mute noise (or not show it in the first place) and let the user accomplish their goals. Have you seen good examples of design to minimize noise and treat consumption as a task? 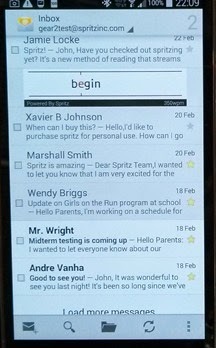 Or other apps similar to Spritz? Please share in the comments!